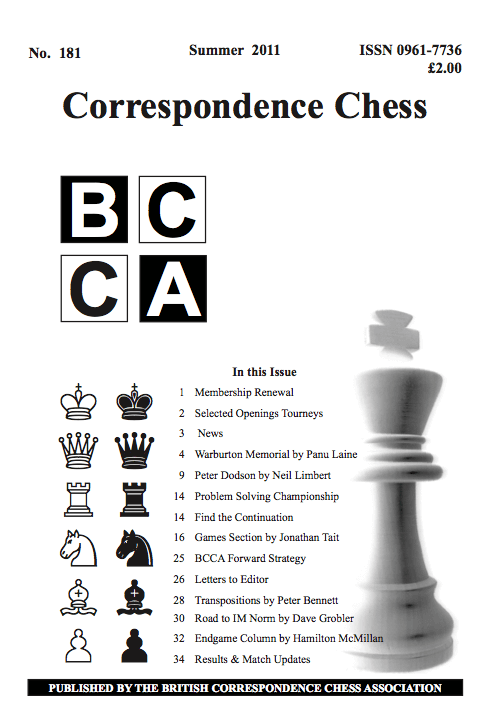 The latest issue of the BCCA magazine “Correspondence Chess” is being posted out to members and subscribers over the next few days. The highlight of the issue is a superb article from Panu Laine on the CC World Champion, Lehikoinen from Finland. There are also articles from Richard Dixon, Stan Cranmer and Neil Limbert together with “Find the Continuation” by Ian Watson and “Endgames” from Hamilton McMillan. BCCA Results & Match updates are also included. Additional issues are available for sale at £3.00 each (UK) or £4.00 overseas; contact the Editor Neil Limbert via this website. There are a limited number of back issues available at a much reduced price of £1.00, or £2.50 for 3 including postage (UK only) for further details see the Back Issues page. Our magazine for Summer 2011, ‘Correspondence Chess’ issue number 181 has been posted to all members and subscribers. 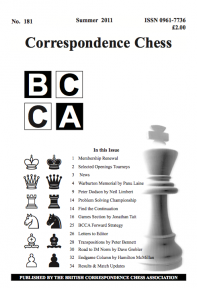 This issue of the award winning correspondence chess magazine edited by Neil Limbert, includes a wide range of news, articles and thought provoking comment concerning correspondence chess and BCCA. I read the Yearbook from cover to cover and found it to be informative and entertaining. I would like to thank you for your words of encouragement over the past couple of years. You will recall I was considering downscaling the number of games I played throughout the year, but then you told me about the British Ladies Championship (of which I was unaware); in my first year of play I came 4th out of 4, last year I came 3rd out of 5 with which I was well pleased. They are tough games against the likes of Valerie Craven (she has won the Title many times) and Sue Howell (another extremely strong player). I also entered the Handicap tournament last year, for the very first time, and did better than I thought, finishing 14th. I duly intend to improve on that over the next year or so. Finally, when the membership fee went up to £11, it is at first a daunting thought “it’s gone up again”. BUT, if one looks at it this way, it is LESS THAN 22p per week so, if anyone else has that thought about fee increases, think of it as less than the price of a 2nd class stamp. Get the old coffee jar or cocoa tin out, pop in 25p per week, and you will be in profit at the end of the year! That’s how I look at it. The Royal Mail will be increasing the price of stamps again in April. But quite a lot of mail gets through without being stamped or franked by the Post Office and I have saved an awful lot on costs by re-using those envelopes. Also, if the franking mark hasn’t caught the stamp, they can, with care, be peeled off and re-used especially the self-adhesive ones.